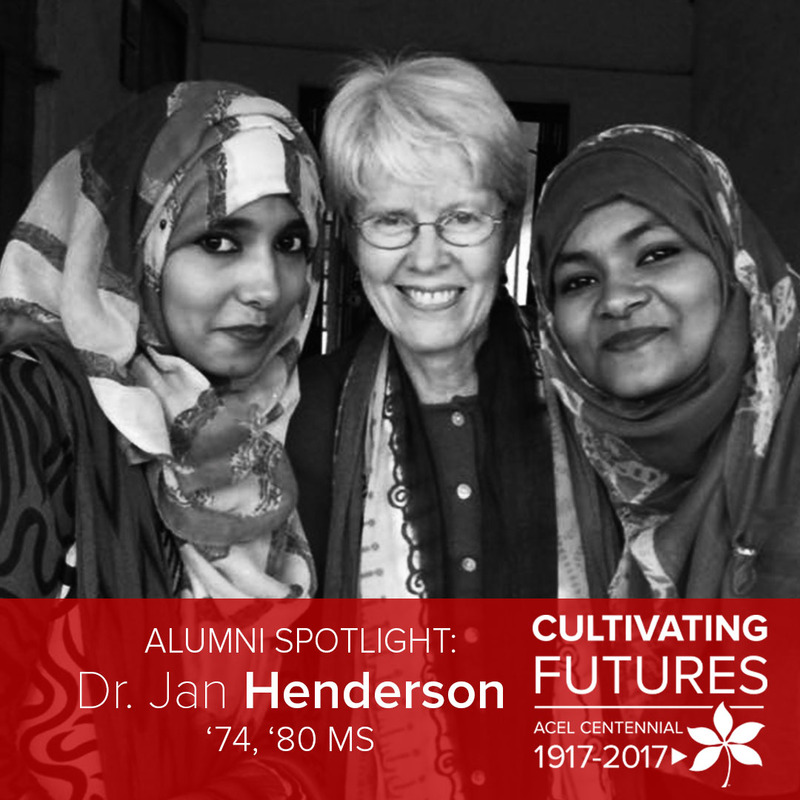 Jan Henderson is from Bay Village, Ohio and currently lives in Westlake where she works for the University of Illinois at Urbana-Champaign, Department of Agricultural and Consumer Economics, as a Senior Capacity Development Specialist. Why did you select your major of agricultural education? I wanted to combine my love of horticulture and my love for people; majoring in agricultural education was a natural choice. My original intent was to pursue a career in horticulture therapy; I completed my “student teaching” experience at Harding Hospital (a non-profit psychiatric facility in Worthington, Ohio) before returning to campus to fulfill course requirements for my teaching certificate. Ohio State was far enough away, but not too far from my home town; the university was affordable and had an excellent School of Social Work which was my initial career interest. I had no previous contact with or knowledge of the University or Columbus before enrolling in fall quarter 1970. My bachelor’s and master’s degrees provided me with the foundation and credentials to pursue not only careers in teaching at the secondary and university levels, but also expanded opportunities to work internationally with non-profit organizations. I loved all of my horticulture classes, even the dreaded Plant ID course with Dr. D.C. “Kip” Kiplinger. However, as the only female (and usually the only non-farm student) in my undergraduate agricultural education and ag science classes I did not always feel welcomed. 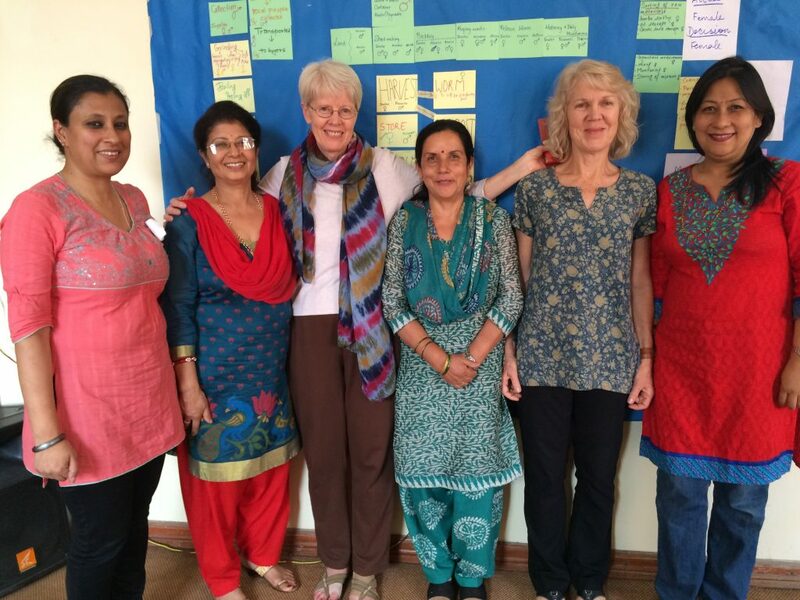 What a wonderful change has occurred as more women have enrolled in the department and have joined the faculty. Did a faculty member have a particular impact on your education and/or career? Dr. Leon Boucher provided much needed reassurance and support during my first year of teaching. I was substituting for a teacher who had suffered a heart attack and those initial visits from Dr. Boucher kept me focused, encouraged, and determined not to give up; he was my biggest cheerleader. 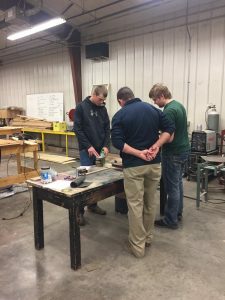 As I began teaching I was at somewhat of a disadvantage by not having taken vocational agriculture in high school and being unfamiliar with the FFA. John Davis and Odell Miller, from the State Department of Education, became my patient “teachers” spending many hours gladly answering my questions during our times together at FFA Camp. A favorite memory is participating in the Little International Livestock Show when I was a sophomore; for a “city girl” with no farm background handling my Charolais heifer was quite an experience! My first job was teaching 11th grade horticulture at Penta County Joint Vocational School in Rossford, Ohio in March 1975. During your career, what honors or awards have you been presented? My favorite career highlights are the times I have spent with students: taking my high school students to FFA Camp and the National FFA Convention; listening to my undergraduate advisees consider their career options; visiting and encouraging our student teachers and first-year teachers; collecting data with my doctoral students in their home countries; and finding ways to make statistics more enjoyable and understandable for my graduate students. I would encourage students to consider enrolling in a study abroad program. Studying in a foreign country exposes students to different ways of being and knowing, to a better understanding of themselves and other cultures, and to new interests, languages, and lifelong friendships. I understand that not every student can afford to study abroad due to financial, work, or family constraints; therefore I would encourage all students to take advantage of any opportunity to encounter and engage with diverse settings and cultures in the U.S.; diversity is all around us if we open our eyes and hearts. ACEL cultivated a commitment to excellence in teaching, research, and service through the faculty and staff who nurtured and supported my education; who had a genuine interest in my well-being and future. I have strived to emulate these role models during my own career journey. My name is Megan Bergman, and I am a sophomore majoring in Agriscience Education. 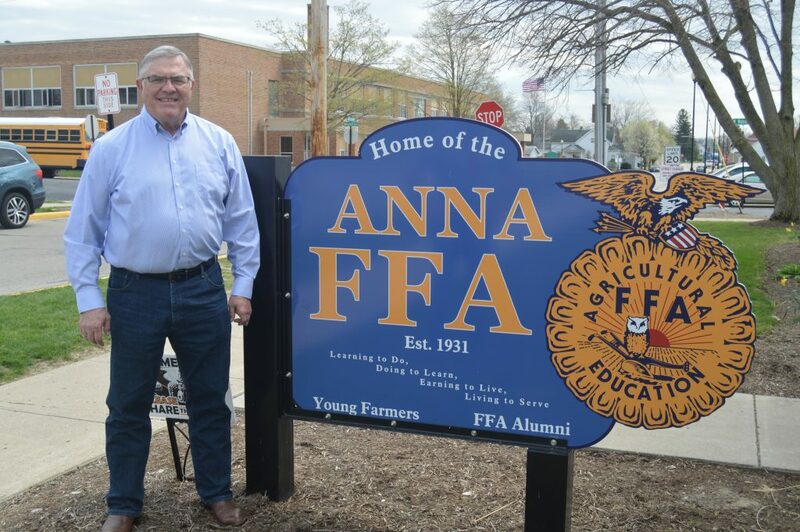 I recently completed my early field experience in the Ag department at Anna Local Schools. I was able to observe the two-teacher program under my cooperating educator, Mrs. Sarah Heilers along with Mr. Tim Zimpfer. Along with observing the classroom and the teaching styles and interactions within it, an important part of the early field experience is thinking about the classroom differently through the guidebook that we complete in our schools. This includes activities like interviews of other staff members at the school, taking note of student interaction, and daily journaling. One of my favorite parts of my EFE was being able to teach a lesson. I had the opportunity to teach the two freshman classes about potential careers in agriculture. After the lesson, students were able to use the Ag Explorer website to see what agriculture careers best fit their interests and talents. It was fun to see the students’ choices of potential careers within the agriculture industry. An aspect that makes the Anna Ag department unique is that while it is a two-teacher program, there are not two classrooms. Mrs. Heilers and Mr. Zimpfer team teach all of their classes, meaning that they are both up front and instructing together. This was interesting to observe. They often bounced ideas off of each other and chimed into the lesson when they had a personal experience that would enhance the message being betrayed. I really enjoyed observing this teaching style and the energy that both teachers brought to the classroom. My EFE was an enjoyable experience thanks to all of the people at Anna. From the welcoming administration to the energetic students, the people were what made my time truly memorable. Mrs. Heilers and Mr. Zimpfer always made me feel welcome, and I never walked away from a day at my EFE without laughing at least a dozen times thanks to them! My early field experience enabled me to look forward to my future career as an agricultural educator. Bergman’s cooperating educator, Mr. Zimpfer working with students. 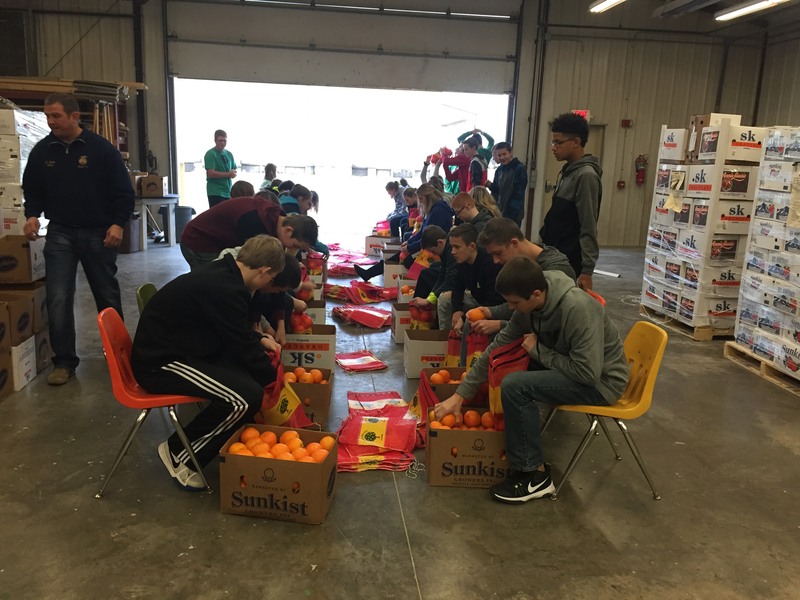 Anna students working with their fruit sales. 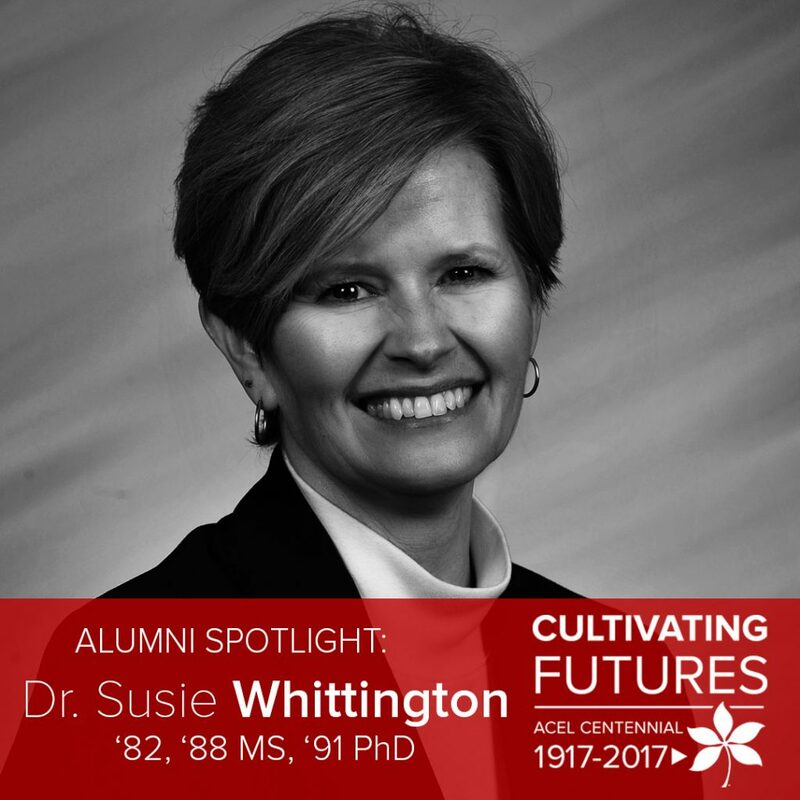 Dr. Susie Whittington is a three-time graduate of our department. She currently serves as the director for the University’s Second-Year Transformational Experience program and is a professor of agriscience education. She graduated from Ohio State in 1982 with her bachelor’s degree in agricultural education and went on to receive her master’s and PhD in agricultural education in 1988 and 1991, respectively. [ACEL]: Why did you choose to major in agricultural education? [Whittington]: I came to Ohio State knowing I was planning to be a high school agricultural science teacher. At that time, all students entered Ohio State through UVC (University College), and were not to enroll in a major for several quarters. To enter a major, students had to meet with the undergraduate coordinator in the major; for agricultural education, that was Dr. L.H. Newcomb. I nervously met with him my first quarter, received the typical “drilling” about why I wanted to become an agricultural science teacher, was enrolled in the major that day, and was hired by him that day to be a work-study student for Dr. Jim Knight. For a rural Ohio kid at that time, there was no other place to consider! However, I never planned to go to college. As a high school agricultural science student, one of my agricultural science teachers brought me to campus. He told me I needed to be a high school agricultural science teacher and I needed to go to Ohio State. As a first-generation college student, my agricultural science teacher was a pseudo-parent in the college conversation. He showed me how to navigate the necessary college entry processes. My education at The Ohio State University prepared me to have the confidence I needed to be a 23 year old, accepting the opportunity to re-open a high school agricultural science program that had been closed. As an Ohio State student, I embraced everything the college and department had to offer! I worked for the department as a work-study student for three years and I worked for Extension my senior year both before and after student teaching. I was fortunate to serve as president of the Agricultural Education Society, secretary of the CFAES Student Council (CAHENR at the time! ), Little I Queen in Saddle and Sirloin Club, and a Little Sis in Alpha Zeta Fraternity (now FarmHouse). I enjoyed the entire curriculum that was required to complete an agricultural education degree and to acquire an Ohio teaching license. 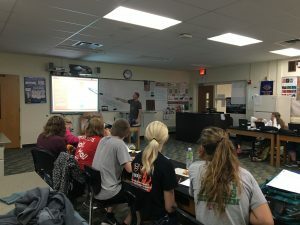 From my educational psychology classes to my animal nutrition class, I appreciated the knowledge the classes were providing in preparation for my career objective. I most loved, however, EVERY class in the Department of Agricultural Education and the professors who taught them: Dr. Newcomb, Dr. Knight, Dr. Hedges, Dr. Henderson, Dr. Starling, Dr. Boucher, Dr. Rossetti and Dr. Ray Miller were highly influential. In addition, during my MS and PhD courses in the department, I was influenced by Dr. Warmbrod, Dr. Barrick, Dr. Blannie Bowen, Dr. Budke, Dr. McCracken, Dr. Larry Miller, Dr. Paulson, Dr. VanTilburg-Norland, Dr. Agunga, Dr. Gliem and Dr. McCaslin. The graduate assistants, at that time, and forever in this department, play a significant role in the preparation of our students…that was very true for me. Of course, given that my favorite class I teach today is Methods of Teaching, it is no surprise that my all-time favorite class was Methods of Teaching with Dr. Newcomb. Did a faculty member have a specific impact on your time at Ohio State? As stated in a previous question, I am professionally a genetic make-up of every professor, graduate assistant, and staff member in this department from 1978 to today. However, I believe that most of us who have earned a PhD might say that our major professor influenced our thinking for a life-time; my major professor was Dr. Newcomb. What is your favorite Ohio State memory? Outside of room 246 Ag Admin, Dr. Knight introduced me to Pat Whittington. The rest is history! What was your first job following your undergraduate education? I was the high school agricultural science teacher at Wellington High School in Loraine County. Share the honors and awards you have been presented during your career. It is hard to write into words the capstone of emotions that are felt each time I experience the incredible opportunity to hood a new PhD at The Ohio State University commencement ceremonies. Embrace engagement in at least one opportunity in each of the following: your department, your college, your university, and the City of Columbus. ACEL cultivated in me a passion for assisting students in achieving their career objective. 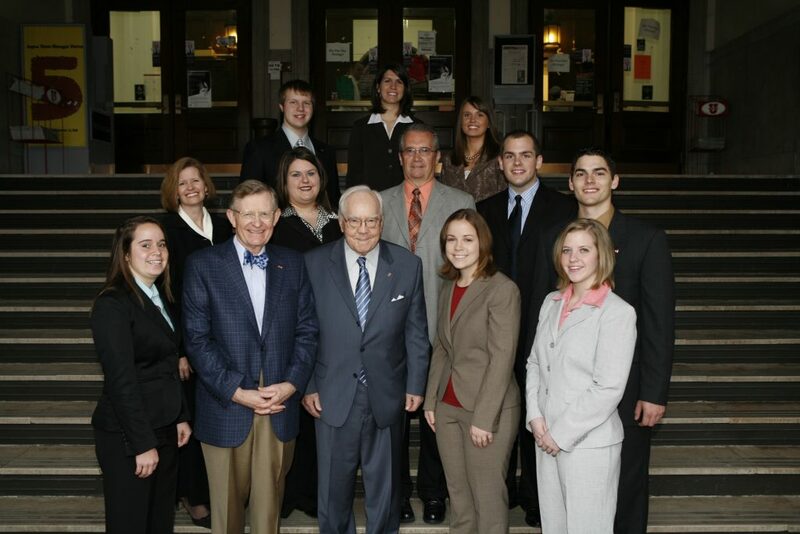 Agricultural Education Society with John Mount and University President E. Gordon Gee during the 125th anniversary of the organization. Dr. Whittington with Dr. LH Newcomb. Dr. Whittington’s office in the former 208 suite of Agricultural Administration. 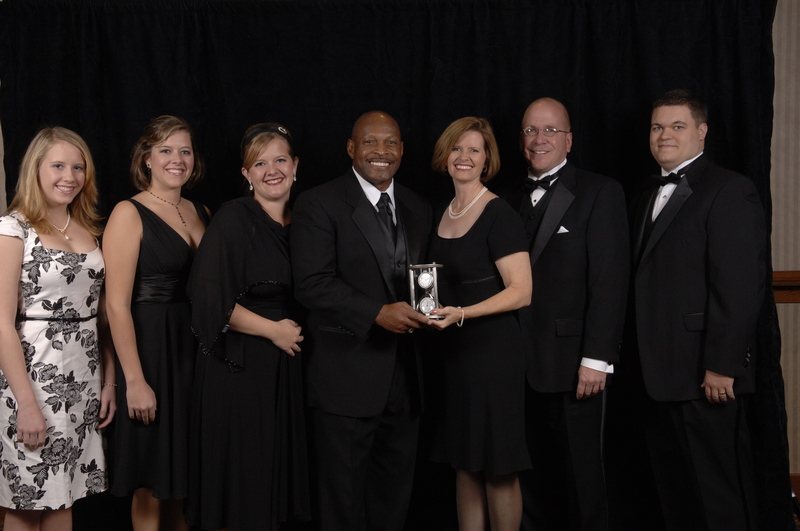 The Whittington Family and Archie Griffin. 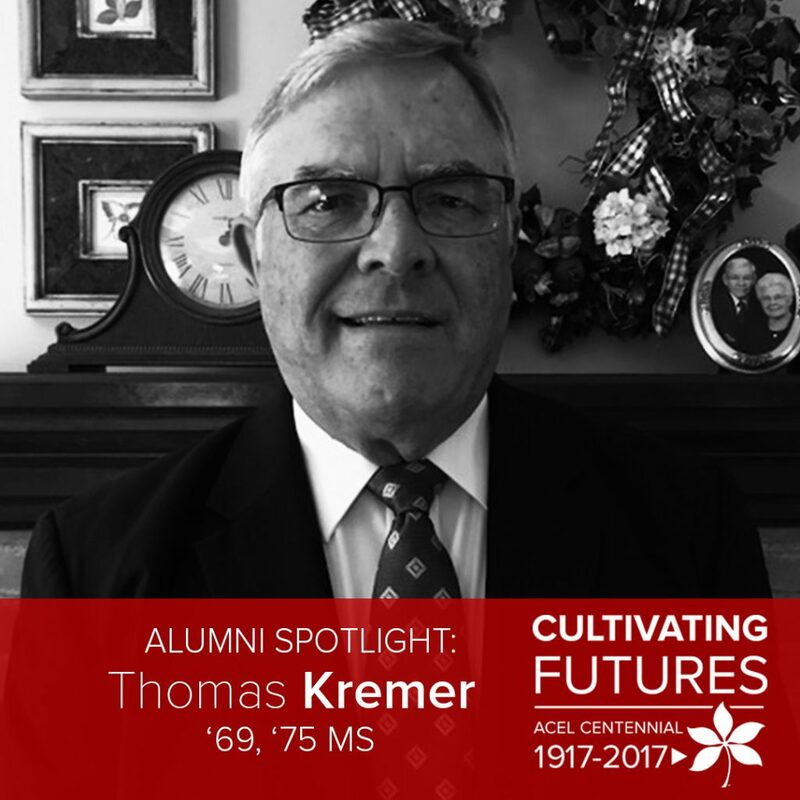 Thomas Kremer is from Versailles, Ohio and received his bachelor’s degree in 1969 and his master’s degree in 1975, both in agricultural education. He is now a retired high school agriculture teacher living in Anna, Ohio. [ACEL]: Hi Tom! Why did you select the agricultural education major? [Kremer]: I decided as a sophomore in high school that I wanted to be an agriculture teacher. My decision was greatly influenced by my high school agriculture teacher, Mr. Ron Vogel. I chose Ohio State because in 1965 it was the only in state university with an agriculture college. How did your education at Ohio State influence your choice or your career path? Already knowing what I wanted to do, I declared my major as a second quarter freshman. I was a member of the Agricultural Education Society and a member of Delta Theta Sigma agriculture fraternity. Coming from a small rural community and being the first and only member of my family to attend a four year college, the educational and social growth opportunities at OSU were vital for my personal maturity and professional preparation. I enjoyed the animal science classes the most as they prepared me for my teaching career. Even though Dr. Jack Cline’s livestock nutrition class was very challenging it gave me a great foundation in animal nutrition and science. 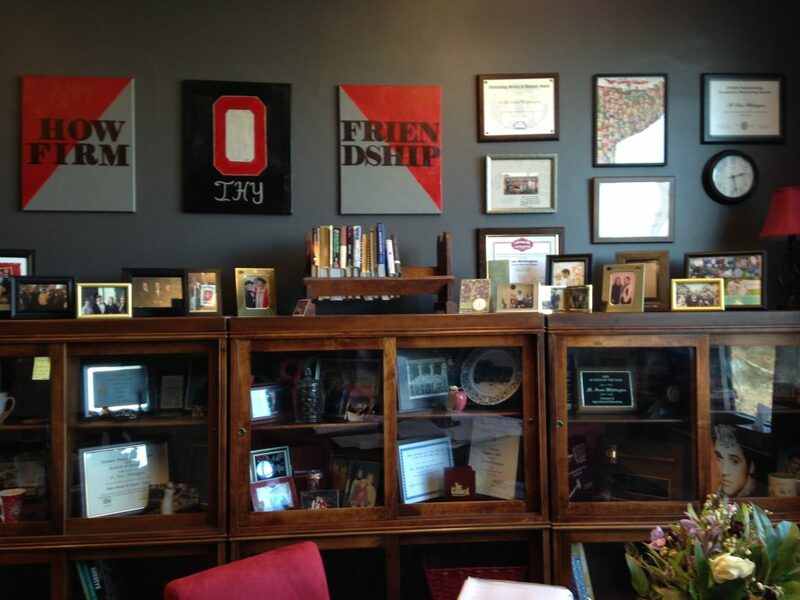 Did a faculty or staff member have an impact on your time at Ohio State? 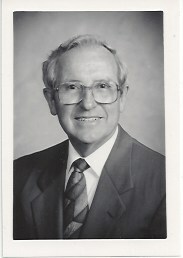 Dr. John Starling, my graduate school academic advisor, had a great impact on my career. 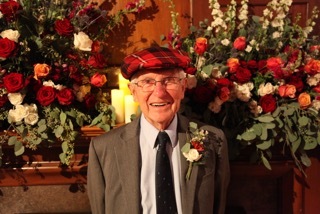 He directed me into classes that best prepared me for my profession. But the person most responsible for my success as an agriculture teacher was Odell Miller. Mr. Miller was my cooperating teacher during my student teaching and has remained a lifelong mentor. He prepared and inspired me toward a successful career. My favorite memory of life at Ohio State would have to be the brothers of Delta Theta Sigma Fraternity and the Buckeye football games. My first job after graduation from Ohio State was the agriculture teacher at Fr. Recovery High School in Ft. Recovery, Ohio. Share the different positions you have held throughout your career. I was the agriculture teacher at Ft. Recovery for two years. I became the Farm Management teacher at the Montgomery Joint Vocational School for four years. I completed my teaching career as the agriculture science teacher at Anna Local School for twenty-five years. Following my teaching career I owned and operated Kremer Equipment and Supply for seventeen years. 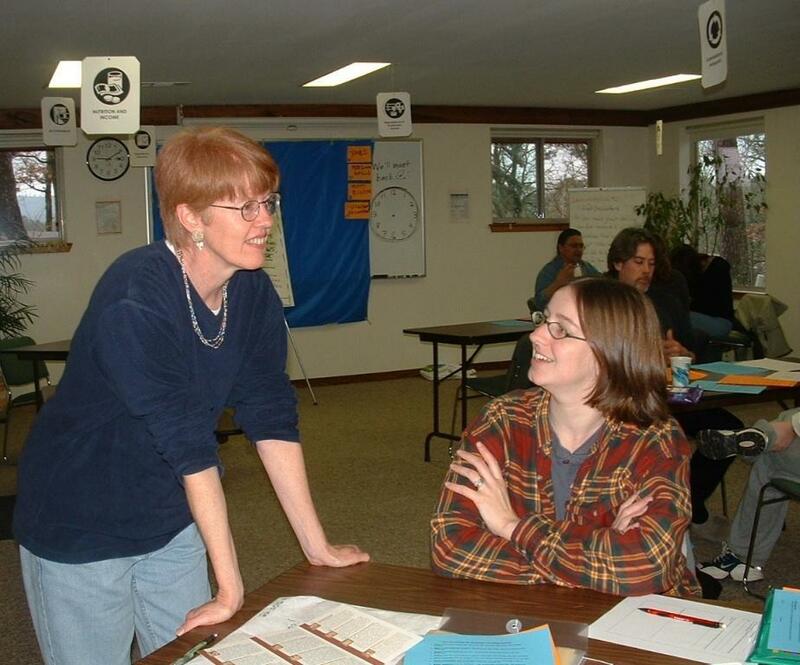 During those years I provided tools, supplies and equipment for agriculture teachers throughout Ohio. I was honored to serve as President of the National Association of Agricultural Educators (NAAE). I was a member and served as Secretary of the National Council for Agriculture Education. I was a member of the American Vocational Association/Association of Career and Technical Educators (AVA/ACTE) policy committee. I served on the National FFA Board of Trustees and also served as a consultant for the National FFA Board of Directors. I was also honored to serve as vice president, president elect, president and past president of the Ohio Vocational Agriculture Teachers Association. I served on the Board of Directors for the Ag Ed Magazine. I was honored to be chosen as the Ohio Association for Career & Technical Education (OVATA) Vocational Educator of the year and the Association for Career & Technical Education (ACTE) Region I Vocational Educator of the Year. I was nominated for the Disney Foundation Teacher of the Year. I received my Honorary State and American FFA Degrees. I received the OVATA Outstanding Teacher Award twice. 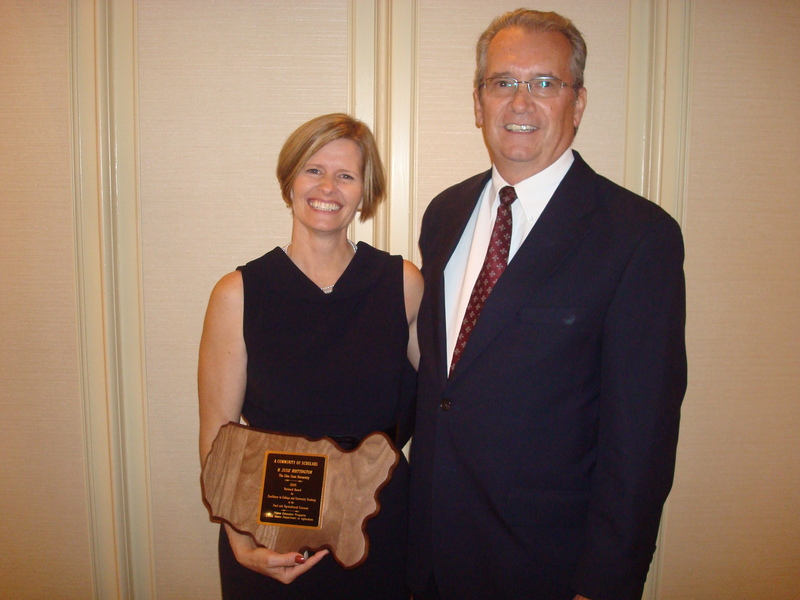 I was recently nominated and honored to receive the NAAE Lifetime Achievement Award. I have three career highlights that are my favorites. 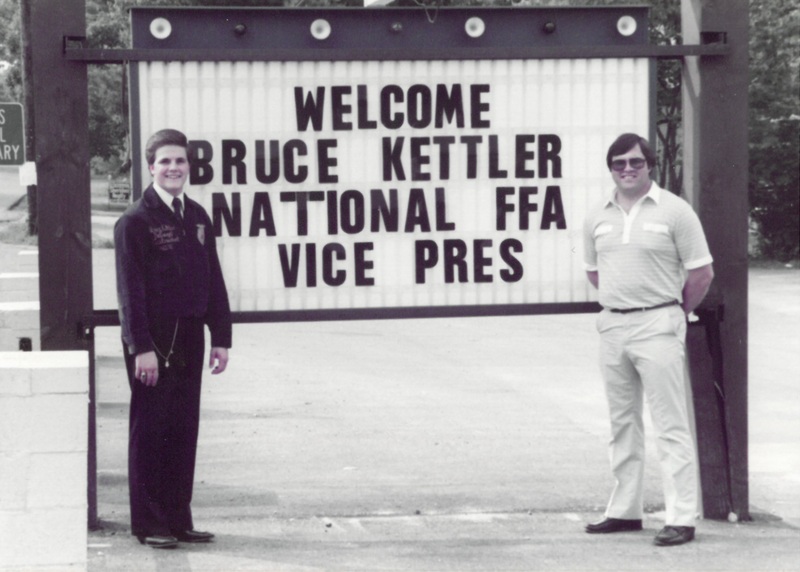 The first was when my student, Bruce Kettler, was elected Ohio State FFA President and then went on to serve as a National FFA officer and is currently serving as the Indiana Director of Agriculture. 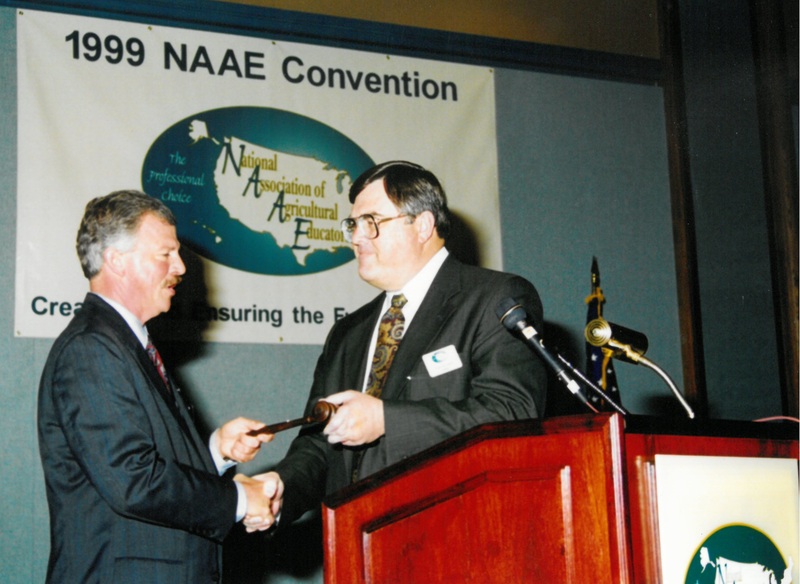 The second was when I was elected President of NAAE and served on the board for five years. 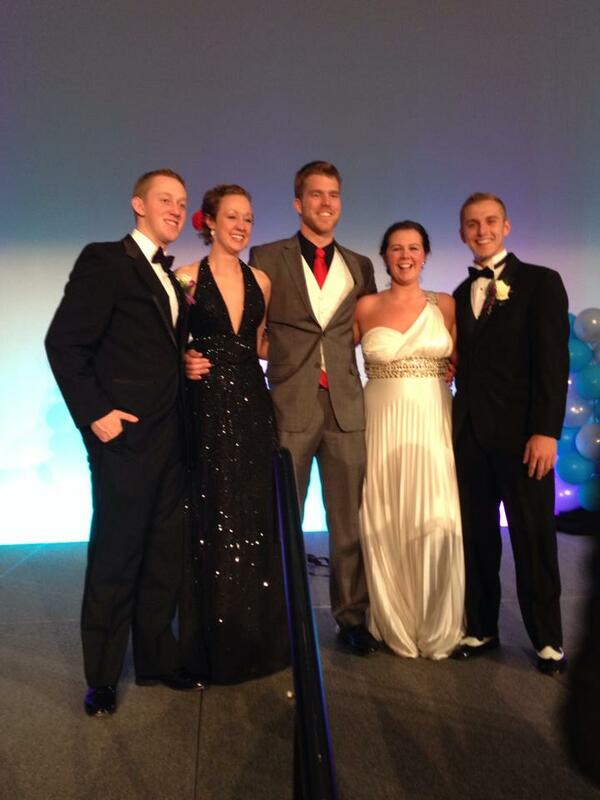 The third is that I have been blessed with having seven former students become agriculture teachers. My advice to a current student is to find a job or career that you really love and you will never dread having to go to work every day. The Ohio State Department of Agricultural Education (now ACEL) offered me the means and opportunities to prepare for a successful career in my profession as a “life toucher”. Kat Zelak is currently in her second year of the ACEL Master’s program where she serves as a Graduate Teaching Associate and President of the Graduate Student Association. Kat’s Master’s Thesis involves looking at the various influences that zoo educators have when selecting programming. Kat Zelak was born in Burlington, Vermont where she lived until her family moved 300 miles east to Rochester, New York when Kat was four. Here Kat lived with her parents and her younger brother on a three-acre lot of mostly wooded swamp on the edge of a wetland. Kat took full advantage of growing up so close to a wetland and spent a great deal of her childhood chasing deer trails and wading in the wetland to find snapping turtles with her brother. Kat was given the freedom to explore as a child, which helped instill a sense of independence. Kat credits her parents with helping to nurture her inquisitive nature. Her mother was especially supportive of her quest for knowledge and love of animals. If Kat found a baby bird, her mother would encourage her to identify which type of bird it was and how she could care for it. These early experiences helped Kat to realize that she wanted to help animals in her future. Kat attended high school in Rochester, New York where she was involved with robotics as well as the marketing and communication team. As a high school junior, she earned her Girl Scout Gold Award, the highest achievement in Girl Scouts. For her Gold Award project, Kat started a summer camp, which focused on robotics and alternative energy. This summer program was so successful that the program ended up expanding and is still going strong today. 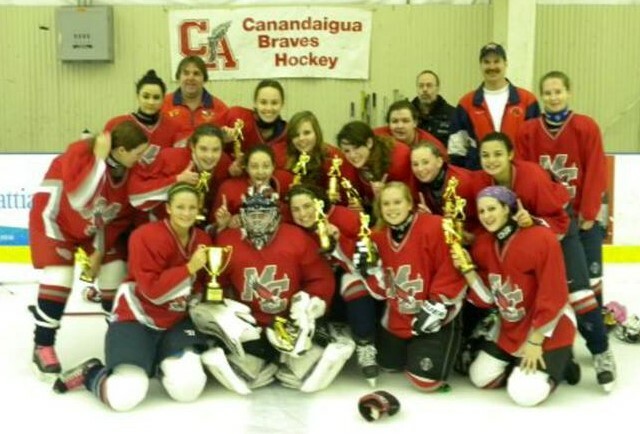 In addition to these achievements, Kat was also involved with ice hockey as both a player and a referee. As a referee, she was able to referee for the girl’s national game, which was played in Rochester. Kat also found time to run varsity and worked as a state official. Kat’s high school experiences reflect a wide range of interests and a willingness to tackle large projects and take on leadership roles. 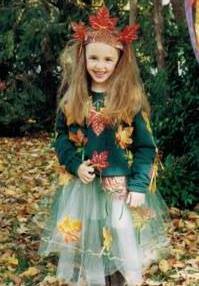 Kat’s love of animals and nature is was evident from an early age- shown here as a tree princess at age three. After high school, Kat enrolled in Cornell University as an Animal Science major. Kat’s early experiences and her love of animals led her to believe that she wanted to become a veterinarian. This is the path that she pursued for the first few years at Cornell until she realized that she was increasingly filling her calendar with activities that would “look good for vet school” not because they were these were experiences she would enjoy. She realized that while she was passionate about animals, she was not passionate about the prospect of becoming a veterinarian. Kat stayed in Animal Sciences but began to explore other courses and look for other career paths. She found that she enjoyed her major more once it was no longer a competition. Her wide interests led her to take on additional majors in Natural Resources and Biology. Kat was able to participate in several research opportunities at Cornell including a summer at the Shoals Marine Laboratory in Maine studying defensive responses in moon snails and some time at a coagulation lab at the vet school working on different blood disorders. One of her favorite research projects was for the Cornell Lab of Ornithology where she spent a summer in the remote Northern Territory of Australia studying the impact of fire ecology. Locals were battling an invasive and combustible species of grass. In an effort to determine if controlled burns or natural burns were the best option, Kat and her group looked at the impact that controlled burns had on the local bird populations as well as the ecological impacts of frequent wildlife disruption. This research kept Kat in the remote Australian outback for four months where the she cooked on a camp stove and the remote location limited her e-mail contact to one time a week. While Kat enjoyed her research experiences, she found she was more interested in talking and sharing about the research. This helpful insight led Kat to explore ways to combine her love of animals with non-formal and outreach education. Kat was involved with ice hockey as both a player and a referee. After graduation from Cornell, Kat took a position working at a songbird rehabilitation center in Burlington, Wisconsin. In this position, Kat worked to rehabilitate as many as 130 birds at a time, a marked increase from the number of birds she would rehabilitate in the wetland as a child. While Kat enjoyed this work, it did not contain the outreach and education portion she was looking for. This led her to accept a position back in New York at the Seneca Park Zoo, a place she had volunteered and interned while she was in high school. She was hired as a Part-time Educator, but quickly moved up to Assistant Outreach Coordinator and then Outreach Coordinator. 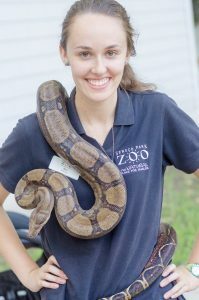 In this role, she was the educator for any outreach program, school, festival, troop, or class that was scheduled with the zoo. She enjoyed this work and liked the balance between program management and education itself. After a year in the Seneca Park Zoo, Kat moved cross-country and began working as an Education Specialist for the Los Angeles Zoo. The L.A. Zoo was a much larger zoo than the Seneca Park Zoo and Kat was able to see how regional differences, zoo size, and politics can change the programs and educational outreach offered at a zoo. 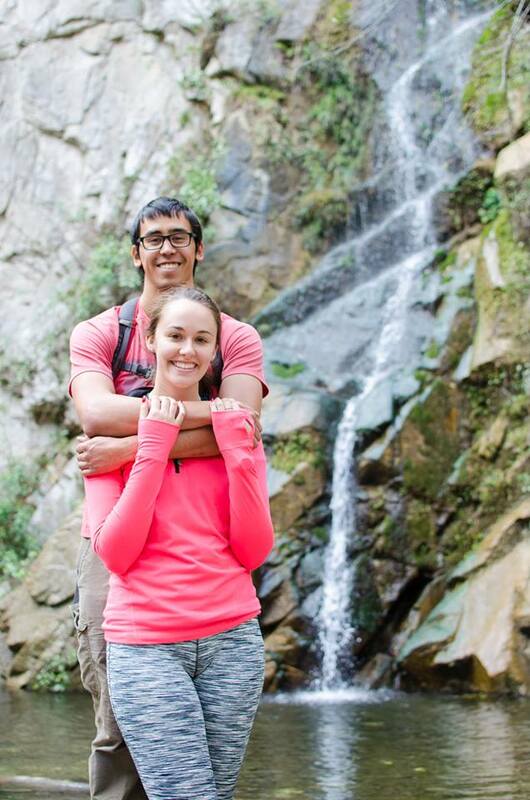 After graduation, Kat plans to spend a month touring the national parks, shown here with boyfriend Alejandro. 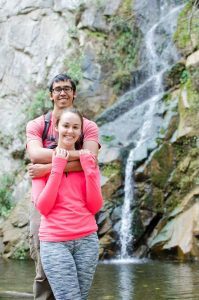 After working in Los Angeles for a year, Kat decided she would like to go to graduate school and was interested in both Cornell and Ohio State. She liked the large size and flexibility at both schools as well as the high level of community involvement and research. Much to Ohio State’s benefit, Kat selected Ohio State where she is in the second year of our Master’s program. For her Master’s Thesis, Kat is taking some of her experiences working at different zoos and looking at the various influences that zoo educators have when selecting programing and presenting information to guests. She is looking at the five large zoos in Ohio: Akron, Toledo, Columbus, Cleveland, and Cincinnati. She has already finished a survey of zoo educators and will follow up with focus groups. Her hope is that the information gathered from this research project can be used to improve training practices. Kat is busy finishing this work this semester and hopes to defend her project in April. After graduation in May, Kat plans to take the opportunity to travel cross-country exploring our county’s national parks. Kat will end her month of national park hopping in Los Angeles where she is working at a summer camp until August. After that, she will start job-hunting for a position in non-formal environmental education. Ideally, Kat would like to be at a zoo, but could also be at a nature center or similar environment where she could combine program management, curriculum development, and community outreach. Until then, Kat can be found most days in the graduate student office in 109 Ag Admin working on her thesis. Kat is also the 2017-2018 President of the ACEL Graduate Student Association, where she has made great strides in building community among all ACEL graduate students. If you have a strong effort to build community among all graduate students, she is interested in working to improve GSA events, any ideas or suggestions can be sent to zelak (.1). My name is Elizabeth Landis and I am a sophomore studying Agriscience Education at Ohio State. This past semester I completed my Early Field Experience at Coldwater High School under my cooperating educators, Mrs. Deanna Wenning and Mr. Mike Seibert. The purpose of an Early Field Experience (EFE) is to give perspective agricultural educators insight to what their career could be like following graduation. 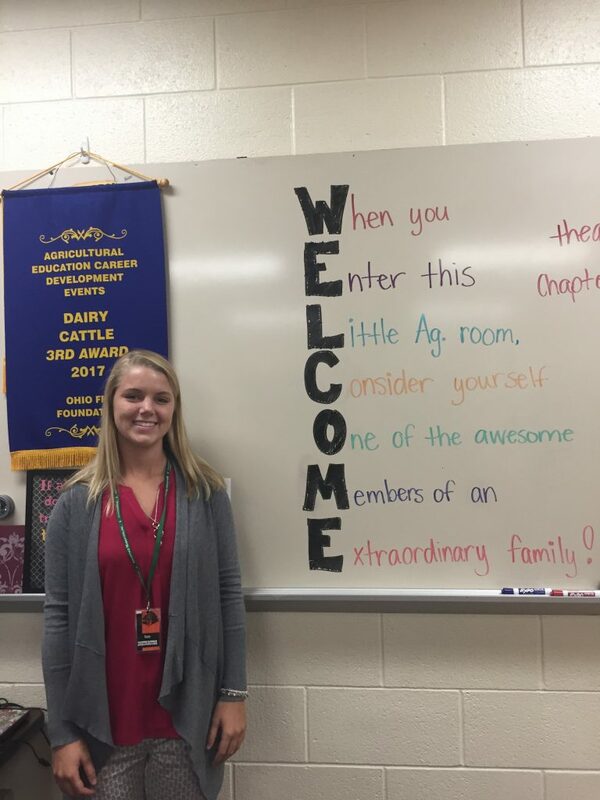 It gives them the opportunity to experience their future workplace from the teacher’s perspective and to discover what the day-to-day life of an ag teacher looks like. EFE students observe the school, the educator, the classroom environment, and the students’ interaction with the educator. 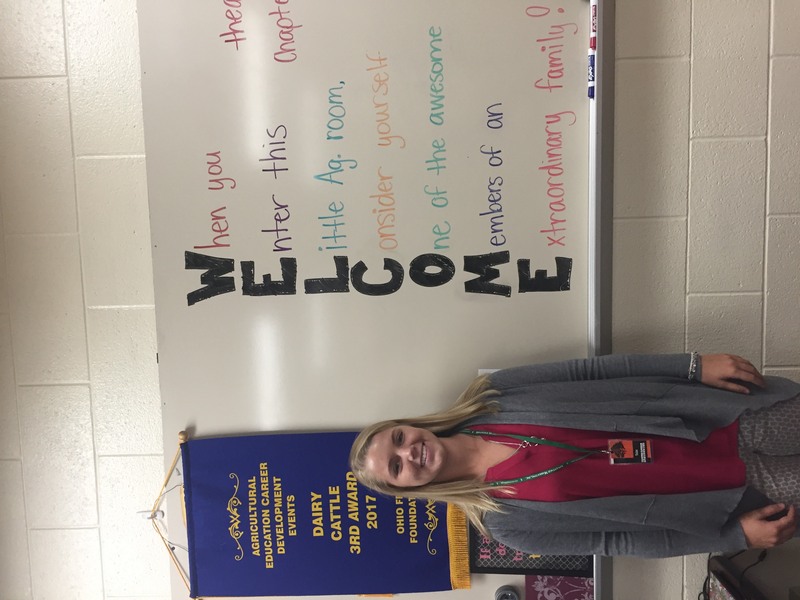 They are responsible for documenting information they learn about their cooperating educator, the FFA program, the staff and administration, and anything else they might want to remember as they begin their teaching career. My EFE experience was unique in that I was able to observe three different technical education programs in one school. Mrs. Wenning taught a more traditional program, while Mr. Seibert taught a vet tech program. 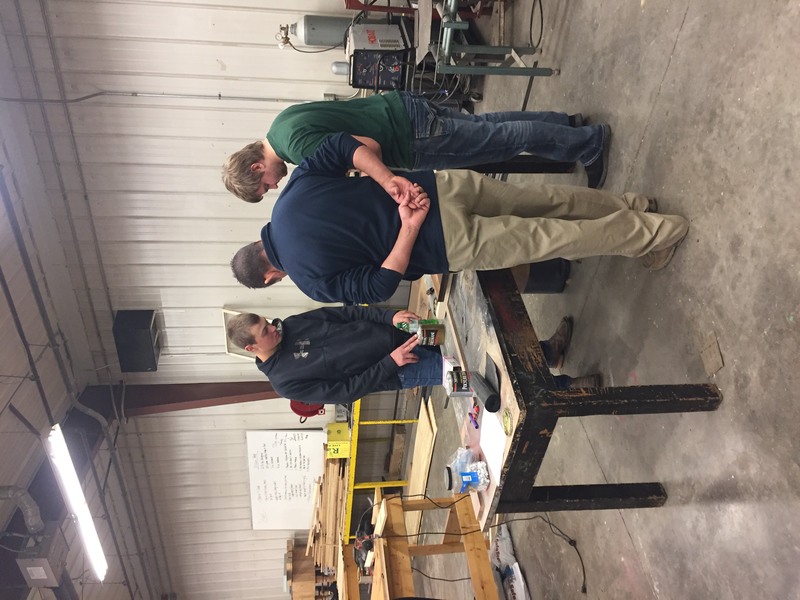 Coldwater also houses an ag mechanics program taught by Mr. Ken Platfoot. I thoroughly enjoyed my time at Coldwater High School because I got to see different programs, different teaching styles, and different classroom environments. I also really enjoyed speaking with the principal and high school guidance counselor at Coldwater. Another exciting part of my EFE was teaching a lesson about soil layers to Mrs. Wenning’s students. This is a very important part of the experience because it gives you the opportunity to put on your teaching hat for a while and get a feel for being in front of students. Overall, I had an awesome experience in the agriculture programs at Coldwater. Because of this experience, I have a better understanding of my future profession, and I look forward to starting my career as an agricultural educator. Elizabeth Landis at Coldwater High School. Classroom set up at Coldwater. 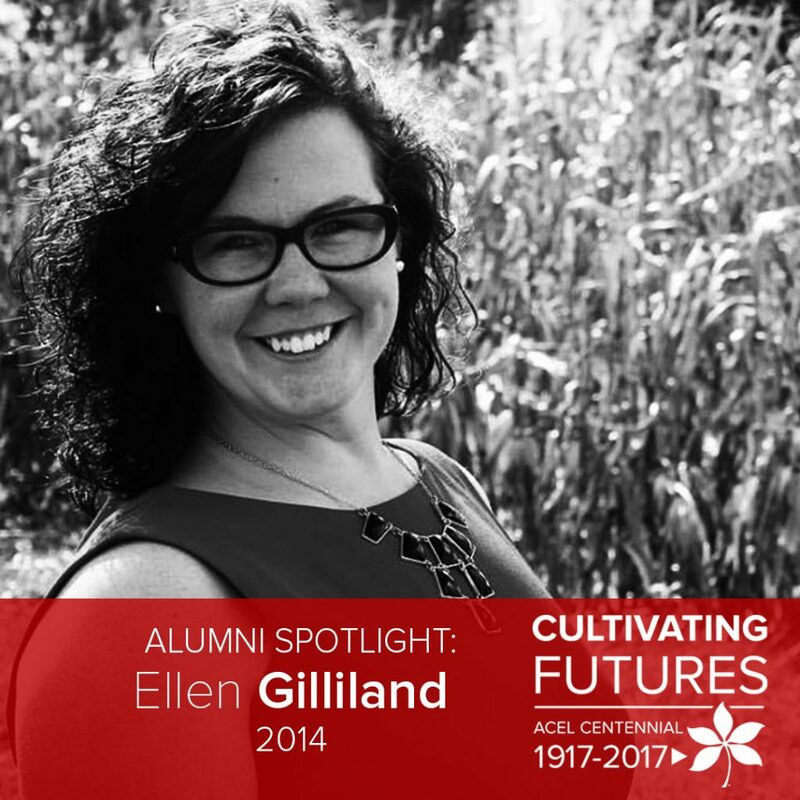 Ellen S. Gilliland graduated in 2014 with a degree in agricultural communication. She now works for Ohio Corn and Wheat as a project manager and stays active in the Ohio State community. [ACEL]: Hi Ellen! You majored in agricultural communication. Why did you select that major? [Gilliland]: I choose agricultural communication as my major because I loved agriculture and I loved talking. It seemed so simple and obvious. Little did I know how impactful the classes would be and how much more communication is beyond talking. I had decided that I wanted to go to Ohio State before I had decided what my major would be. I wanted to stay within Ohio for my education and I wanted to go to an excellent school that had a major allowing me to further my experience within agriculture. Ohio State was the answer to all of my hopes and dreams. My decision to Ohio State and my education from there is the whole reason I have a career! Since my first day at Ohio State I was exposed to job opportunities, learning experiences and way to better myself as a student and a professional. You were really involved on campus outside of the classroom. 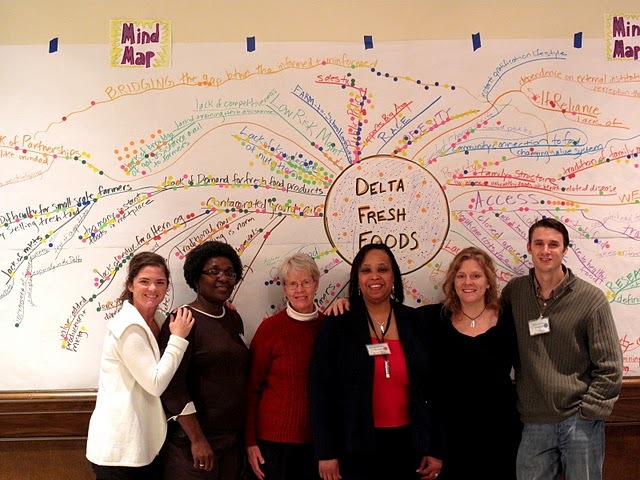 Share some of the organizations and experiences in which you participated. I was a very active and involved student, within my classes, major, college and the university. Some of the organizations I was in included: Agricultural Communicators of Tomorrow (president), National Agricultural Communicators of Tomorrow (Vice President), College of Food, Agricultural and Environmental Sciences (CFAES) Peer Mentors (transition student lead), Buckeyes Against Hunger (founder, secretary), Saddle & Sirloin (committee chair), CFAES Student Council (president), Beanie Drake student scholarship and endowment board of directors (secretary), Undergraduate Student Government campaigns (grounds game), CFAES Towers Honorary (vice president), Alpha Sigma Upsilon (president). Though this is a long list and to some is nothing but a long list of meetings, agendas, and so on. To me this is a list of memories, accomplishments, learning moments, teaching moments, experiences and impact. Each organization served a specific purpose in shaping my college career. Each organization holds a special place in my heart. As a senior at Ohio State I was selected as one of three recipients among all undergraduate students for the Spirit of a Buckeye award. To be selected, you have to be nominated by a faculty or staff member or student. Spirit of a Buckeye recipients are selected based on achievements in both academics and other involvement across the university. This was such an honor, and I think it is really a perfect way to describe my mentality while I was studying there and even now. 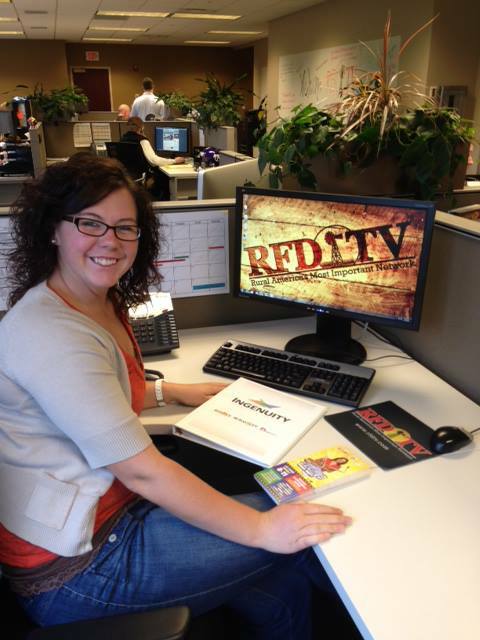 Upon graduation I moved to Omaha, Nebraska and worked for RFD-TV as the marketing manager. Where has your career taken you since your first job? I currently work for Ohio Corn & Wheat as the project manager. As the project manager, I oversee several initiatives to represent Ohio grain farmers and provide long-term profitability. My duties include overseeing student member benefits, leadership initiatives, assisting with communication, supervising the internship program, event planning and all meeting coordinating. Previously, I worked as the marketing manager at RFD-TV in Omaha, Nebraska and worked with the Chief Marketing Officer to organize and execute projects such as ads, publications, and commercials with the creative team. Though the work I do is not for the recognition, but rather the commitment to being that person to help students like the alumni that helped me as a student, I have been recognized for my time and effort. Just 3.5 years into my alumni status I was both surprised and honored to be named distinguished alumni by three different groups already! Alpha Sigma Upsilon, Agricultural Communicators of Tomorrow and Alpha Zeta Partners have recognized me for contributing to their organizations. I would suggest to current students to get involved outside of the classroom with student organizations and internships. I would recommend traveling abroad and gaining understanding of a global perspective. I would advise them to have fun and soak up the networking, opportunities and memories that they experiences every day while at Ohio State. ACEL cultivated in me an appreciation for all that is available outside of my comfort zone. Everything from international experiences to career opportunities and new ways of thinking to skills that have set me up for success. 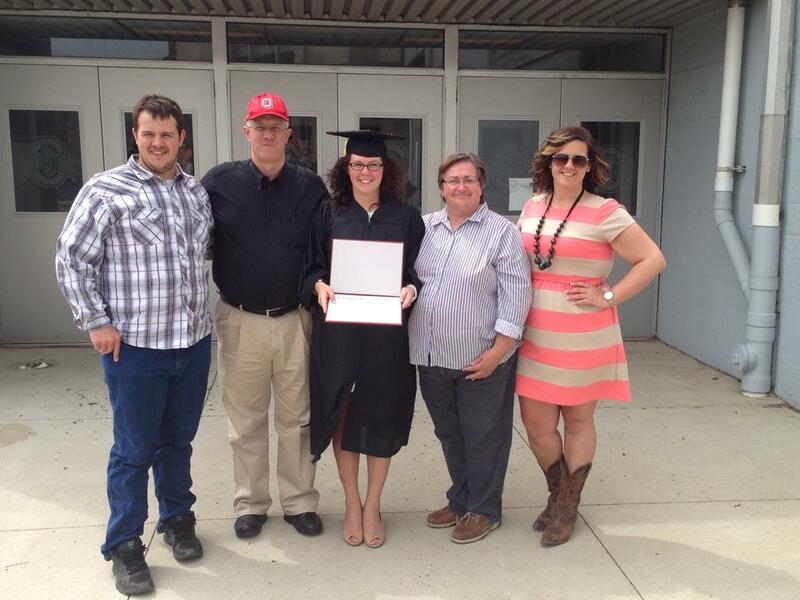 Ellen and family following her graduation from Ohio State. Ellen and some of her best college friends at the CFAES Recognition Program. 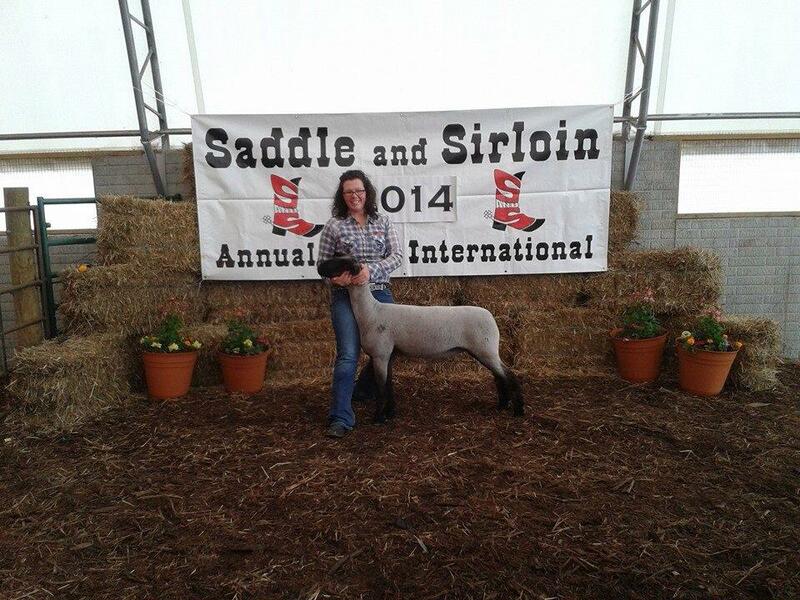 Showing a sheep at the 2014 Little International Showmanship Competition. Working at RFD-TV in Omaha, Nebraska. 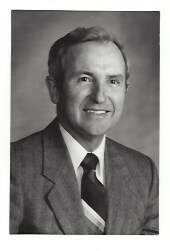 Dr. Clarence J. Cunningham graduated in 1953 with his bachelors degree in agricultural education. After teaching, he returned to complete his masters degree in 1958 and a doctoral degree in 1964. He is now retired from The Ohio State University as professor emeritus. 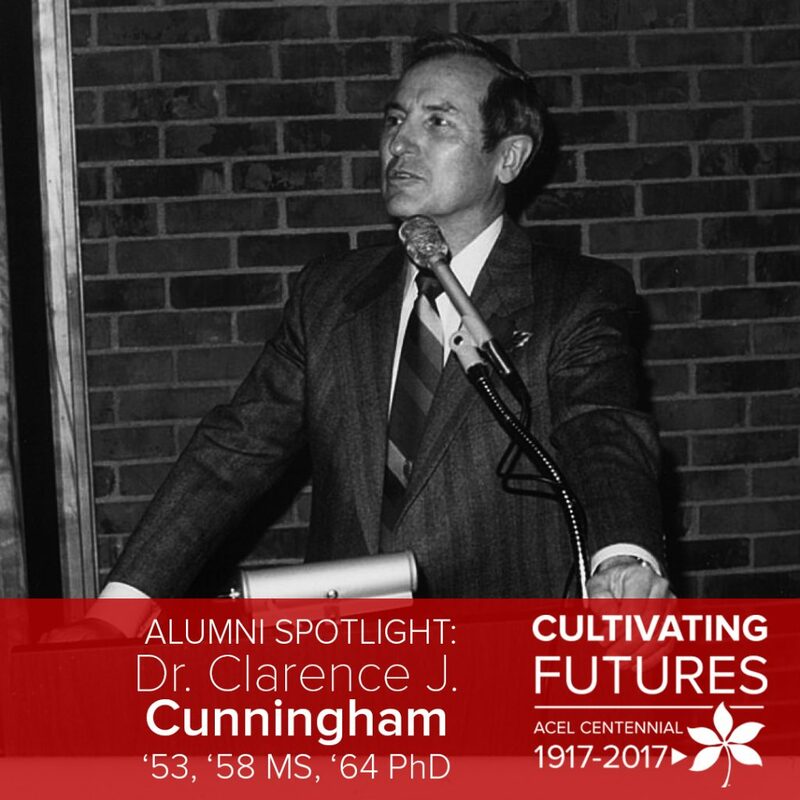 Dr. Cunningham reflects on his decision to attend Ohio State, his time as a student in our department and his professional career. While high school teachers encouraged me to go to college, the decision to major in agricultural education was influenced most by Dr. Howard Miller, a graduate of the department who was the county extension educator with the 4-H program in Wayne County. My interest in attending Ohio State University was initiated by having been on the campus many times for speech and theatre state programs while I was in high school. I had an interest in poultry science but really wanted to be an educator in the 4-H field. My undergraduate program in agricultural education started while a resident in the stadium dorm with 17 other entering freshmen. By the third quarter there were eight of us left living in the dorm – which means ten were not enrolled at OSU. Beside academic study, my focus was on involvement in student organizations and working to earn money to stay in college. My primary student organizations were the University 4-H Club and the Agricultural Education Society. In later years I was also in an agricultural fraternity, Alpha Gamma Sigma. My part time work included being a referee at student softball games, selling shoes, analyzing farm account records for the University staff. My success in finding summer work permitted me to be able to graduate with no debt. The decision to continue with the MS and PhD degrees at The Ohio State University was influenced Dr. Ralph Bender, my academic adviser, and Dr. Robert McCormick. They both stressed my need for the advanced degrees and helped me find ways to finance additional education. My undergraduate study focused on study in agricultural education, dairy science, animal nutrition, and agricultural engineering. 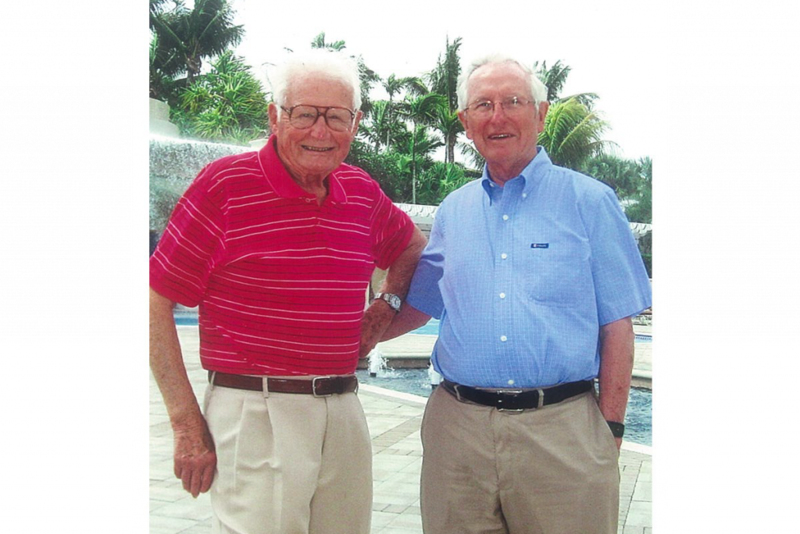 I was pleased with my introduction to the department by having course work with Dr. Wilbur F. Stewart, the first chair of the department and Dr. Ralph E. Bender, the then chair of the department. They were successful in challenging me to be successful and guided my early study. My favorite memory of my undergraduate study was that I became acquainted with a young lady from a farm who would become my wife and partner for the next almost 40 years. At graduation with the BS degree I decided that teaching vocational agriculture would be beneficial, even though my interest in working the OSU Extension Education program continued. Traveling throughout Western and Northwestern Ohio with other graduates to meet with local school boards resulted in my being hired to teach vocational agriculture at Northwestern in Raymond, Ohio. It was a successful and wonderful experience. The U. S. Army then continued my education resulting with an introduction to understanding military intelligence. An early discharge permitted me to return to OSU to complete my masters degree. My professional career from that point forward was with The Ohio State University in the College of Agriculture, Food, and Environmental Science. The first position was as a county extension 4-H educator in Pickaway County where we resided in Circleville. Two plus years later we accepted an offer to join the OSU campus Extension Service with assignment to the 4-H staff. About three years later with encouragement I was moved to complete my PhD degree while continuing part time work in the Department of Agricultural Education and the Extension rducation. After completion of the PhD degree I was assigned 30% time to Agricultural Education and 70% time to the Extension education. I taught the introductory course for two years while also starting my work with teaching graduate courses in program development, evaluation, and research methods. During this period of time my responsibilities changed several times but included a focus on planning noncredit education, directing orientation programs for new employees, directing the evaluation of the Ohio Extension Education programs, and planning educational experiences for international visitors. Severed on several national committees including: planning evaluation for new food and nutritional program, designing new evaluation system for Extension Service, designing no needed program directions in the country, fiscal management in Extension. In the early 1980’s my responsibilities became full time employment with the Ohio State University Extension. My responsibilities focused on personnel and financial issues of the organization. With my former advisor, enjoying our retirement in Florida.